Accurate Sales Insights and Inventory Management for uninterrupted growth. Know your true profit margins. Set up and go. The system continuously pulls your Amazon statistics completely. Zero manual intervention required. Monitor, manage and scale with ease. Enables you to get profit and inventory insights in seconds. The tool is built to fit your business goals perfectly. Customize the numbers to make the data work for you. Our unique platform combined with expert in-house consultation leading you to the right strategies. Do you still manually calculate your Amazon profit margins by doing a ton of calculations? 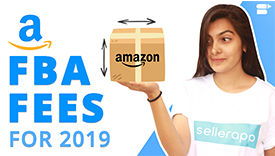 With SellerApp, access and monitor all your Amazon sales and profit breakdown all at one place. Analyze the products that are costing you money versus the ones bringing you profits without having to manually dig through reports. All the sales and profit data automatically calculated and put down in one place. Filter and sort your products however you need it - on the Order, Revenue, Listing price or even the date the listing was created, without even having to run through spreadsheets or write a formula. Keeping a watch on the right metrics is the first step to success. The Amazon Profit Dashboard automatically tracks all the major metrics that keep your business up and running. Generate insights from sales trends, data, and metrics to set the right targets and forecast future sales performance. View profit breakthrough from the topmost level to the SKU level enabling you to analyze where your real profits are. Use a variety of charts, KPI widgets, tabular columns, and pivot tables. Drill down into your data for the insights you need. Seamlessly integrated with your Amazon Seller Central account, you save yourself from the hassle of manually calculating profits or create reports. With no inventory, your Amazon listing constantly recedes the search ranks and the best seller rank. Left unnoticed for just a couple of days, your listing could plummet to positions beyond which you’ll have to spend time and money running promotional activities to redeem your position. With per ASIN product breakdown on your inventory health, you’ll no longer have to manually keep a track on inventory. Whether you are focussed on increasing your margins or your profits, stocking the right products is crucial for maintaining low costs and high profits. But how to determine which products yield the most profit? How to determine the when to stock up these units? Get a top-level overview of the products that are performing the best, bring the highest revenue. Drill deeper to check out the contribution margins of each product, while SellerApp keeps a check on the dates to reorder your stocks. Worried about the products that are not performing well? Let our suite of tools reign over your product and you’ll have your problem all figured out and sorted in no time. No longer will it take days for you to stumble upon the fact that your listing had been hijacked. On setting up the Listing Hijacker Alert, SellerApp constantly monitors your Amazon listings to get notified instantly when any of your Amazon listings have been hijacked. With immediate notifications and alerts, you are always armed to immediately respond to counterfeits trying to tarnish your brand name and identity. At any time you log in to your SellerApp account, you’ll be able to view the number of hijackers selling under your listing. How do I set up the SellerApp Profit Dashboard? How long does it take to import all my Amazon data? What marketplace does the Amazon Profit Dashboard Support?